Download free Illinois Fighting Illini fight songs and cheers to your iPod. Get University of Illinois ringtones downloaded to your mobile phone online. 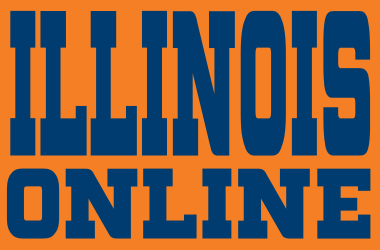 Download free Fighting Illini ringtones at Big Ten Football Online. Get Oskee Wow Wow ringtone download for your iPod, iPhone, Android or mobile phone. With our Big Ten football ringtones, fans can listen to their favorite Big Ten school fight song, alma mater and all the cheers associated with all the greatest athletic teams in the nation. Get free Illinois Fighting Illini ringtones at Big Ten Football Online and listen to the best fight music ever made. Old Princeton yells her tiger, Wisconsin her Varsity. And they give the same old “Rah-rah-rah! at each university. is the good old Oskee-Wow-Wow that they yell at Illinois. Oskee-Wow-Wow, Illinois! Our eyes are all on you. Oskee-Wow-Wow, Illinois! Wave your orange and your blue (rah, rah!). When the team trots out before you, every man stand up and yell. Back the team to gain a victory. Oskee-Wow-Wow, Illinois! Teddy Roosevelt may be famous, and his name you often hear. But it’s heroes on the football field each college man holds dear. We think with pride of Roberts, Artie Hall and Heavy, too. Oskee-Wow-Wow for the wearers of the Orange and the Blue! For we know you have sand, Illinois, Rah! Rah! Oh boys, for we expect a victory from you, Illinois! Che-he! Che-ha! Che-ha-ha-ha! Go Illini, Go!